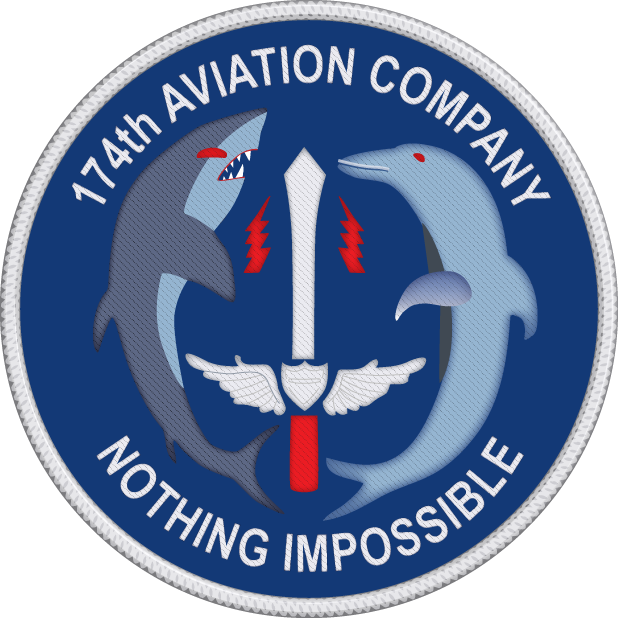 The link below (near the bottom of this page) will take you to a list that provides information for all known Dolphin and Shark helicopters in the 174th AHC from April 1966 until November 1971, when the 174th AHC "stood down" as a unit. The first aircraft were transported from CONUS to Vietnam via a WWII vintage "baby flat top" carrier, the USS Point Cruz. 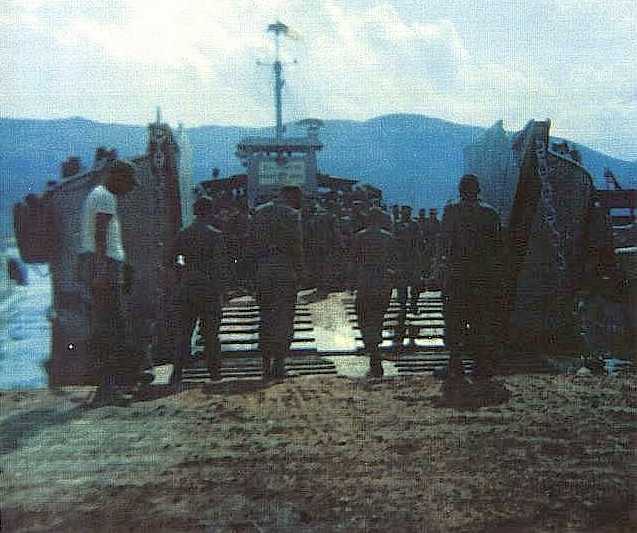 Most personnal arrived at Qui Nhon in April 1966 aboard the passenger ship, USNS Upshur, while the aircraft were taken to Vung Tau Airfield for preparation. 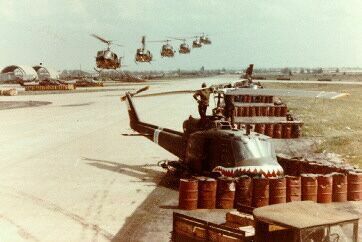 The 174th arrived in country with fifteen UH-1D Dolphin "slicks" and nine UH-1C Shark "gunships." Due to some political wrangling within the Department of Defense back in the mid-1960s about aircraft missions and the introduction of new models of aircraft, the new UH-1C gunship ("Charlie-model") was initially designated as the UH-1B(540). It implied an upgrade to an existing model rather than the introduction of a new model, something the Army was not supposed to do back then. 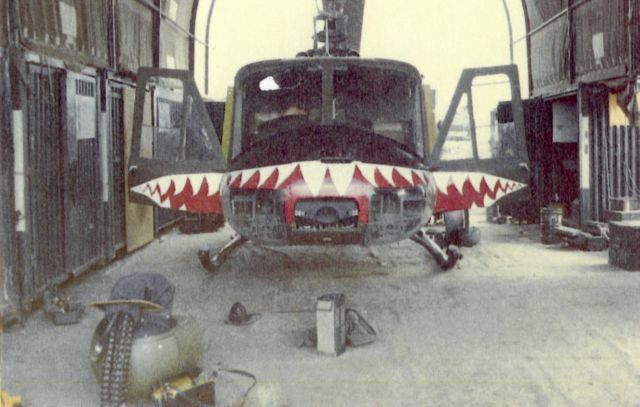 While some sources document that the Sharks were initially equipped with the UH-1B gunship with the 540 rotor system, and some say they were conventional UH-1B airframes with 540 rotor systems, they were not. 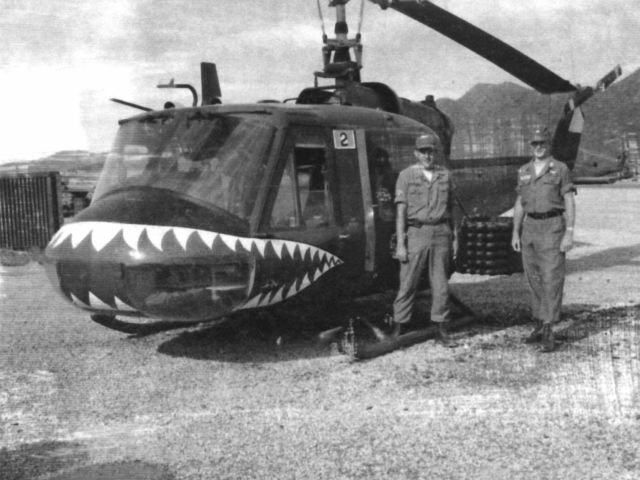 There are siginificant structural, systems, and equippage differences between the UH-1B and the UH-1C, and close photographic analysis of the early Sharks prove they were indeed UH-1Cs in all respects. The reference to UH-1B(540) in the attached tail number listing has proven to be in error. Not long after the 174th deployed to Vietnam, they officially renamed the aircraft to its correct designation, UH-1C. Left, the bridge of the USS Point Cruz. -- Right, 174th's helicopters en route on the flight deck. 174th's helicopters on the flight deck, "shrink wrapped" to protect against ocean/sea elements. Maintenance crews begin to prepare the aircraft to be flown off the carrier at Vung Tau. Shark gunship with 40mm grenade launcher on the nose turret, undergoing preparation in hangar deck. 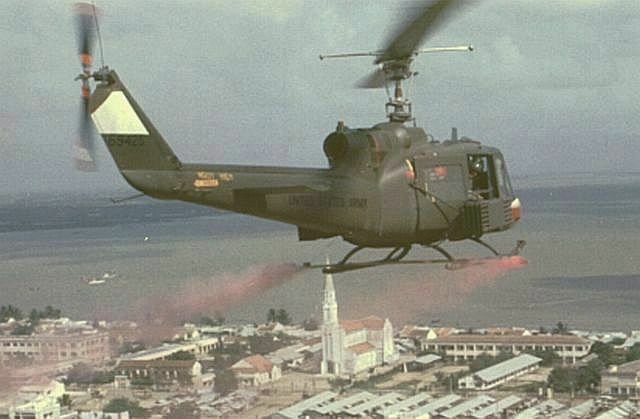 The first elements of the 174th Aviation Company come ashore at Vung Tau Bay. 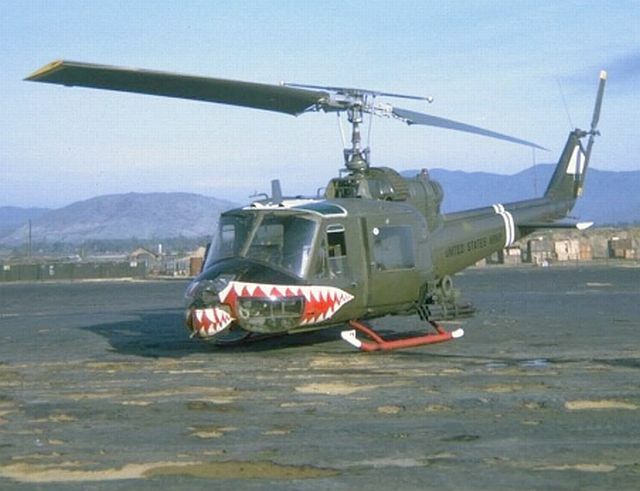 In September 1966, the Unit received six more UH-1D Dolphin "slicks." The attached list provides the following information: Helicopter model (MODEL); complete tail serial number (S/N); date arrived in unit (ARRV); aircraft hours on airframe upon arrival (HRS1); date of departure from unit (LEAV); airframe hours on date of departure (HRS2); and total hours acquired while in the 174th AHC (HRS3). 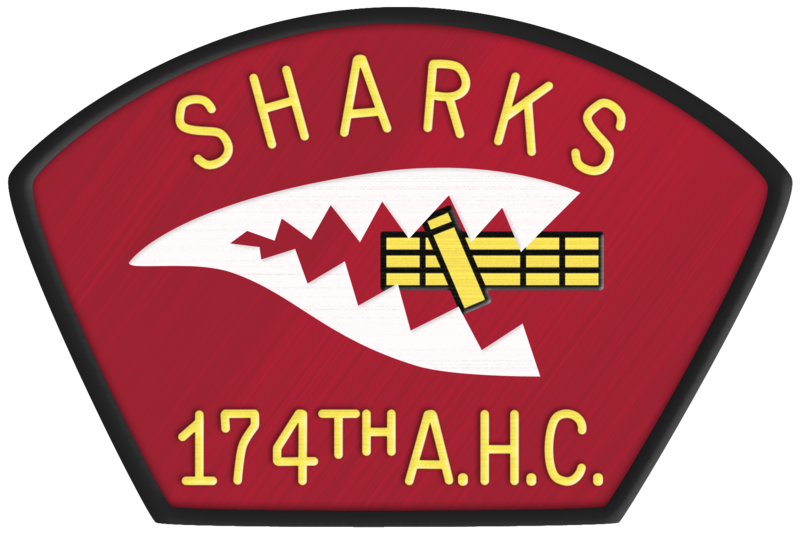 The comments column are personal accounts from 174th AHC members by either personal one-on-one meetings, phone conversations, or e-mail correspondence. Please see sources of historical information and credits on the last page. Please feel free to e-mail the Webmaster any time with your additional comments. 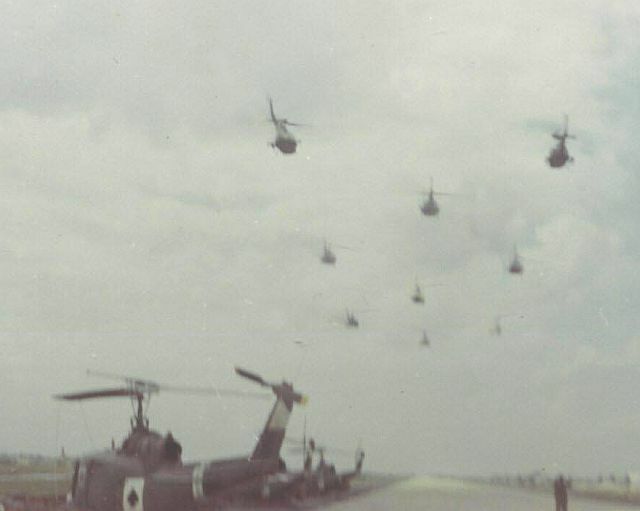 Total helicopters assigned to 174th from September 1966 to unit Stand down in 1971 = 164. Total number of hours flown by 174th helicopters = 142,370. Dolphin with most hours in 174th = Dolphin 67-17471 with 3,368 hours. Shark with most hours in 174th = Shark 66-15137 with 1,778 hours (40mm). Dolphin with least hours in 174th = Dolphin 65-09933 with 0 hours. First flight never got logged--aircraft was lost in Nov 66. Shark with least hours in 174th = Shark 65-09504 with 1 hour. Lost on first mission in Aug 68. Total 174th helicopters that arrived in unit with less than 100 hours on airframe = 69. Total 174th helicopters that left with less than 100 hours in unit = 14. 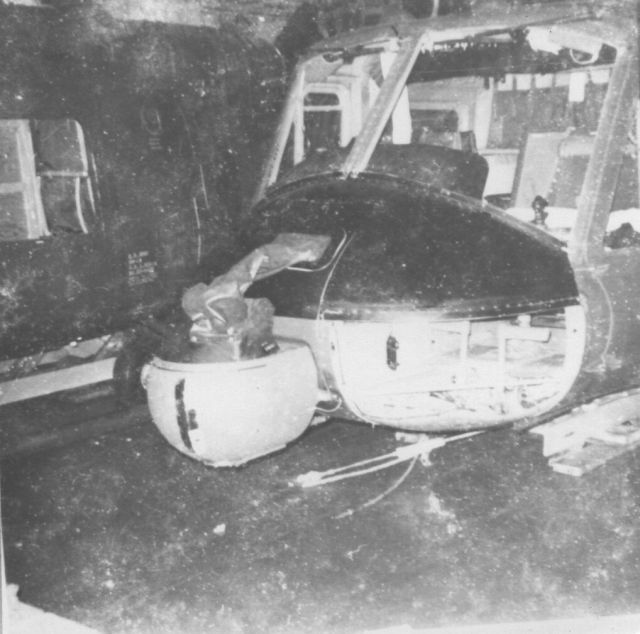 Only 174th helicopter to crash in its own revetment = Shark 66-15162 (on a "scramble" take-off at Duc Pho 7/29/68). 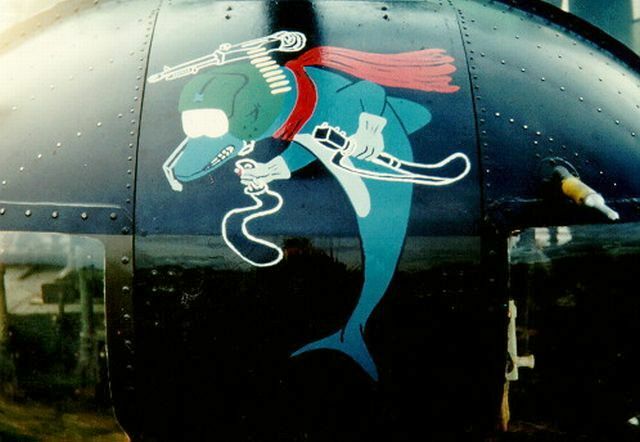 Below, the first Dolphin to sport the Dolphin nose art was Dolphin UH-1D 66-16235. It was designed in June 1967 by WO1 Richard Machina and set the standard for the next three years. 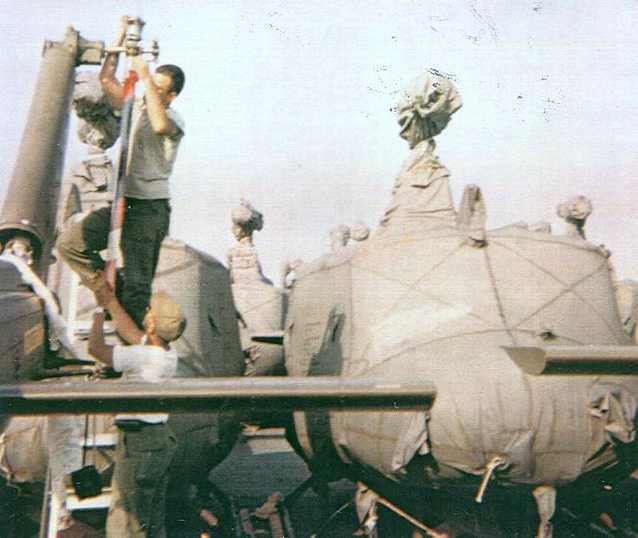 Machina was wounded in this very aircrat and medivac'ed back to the States shortly after completing the artwork. There were a lot of different variations through the years, but the template and theme remained similar. Above: The popular Dolphin nose art by WO1 Richard Machina, June 1967. Please note the helicopter tail number list is 61 pages long. To view, just click on the link below. It is in PDF format. Feel free to view it, save it to your PC, or print it.